The University of Wisconsin–Stout women’s dance team competed in the National Dance Association Invitation from April 8 to April 12 in Daytona Beach, Fla. The NDA Nationals is a nationwide collegiate competition recognizing various teams from across the country in several styles of dance. The dance team is recognized as an athletic team at Stout and follows all the regulations of any other athletic team, but they are not officially recognized as a part of the NCAA. In order to qualify for the NDA Invitation, the team was required to send videos of each of their competition routines, which were intensely reviewed by a board that then notified the team that they were invited to participate. 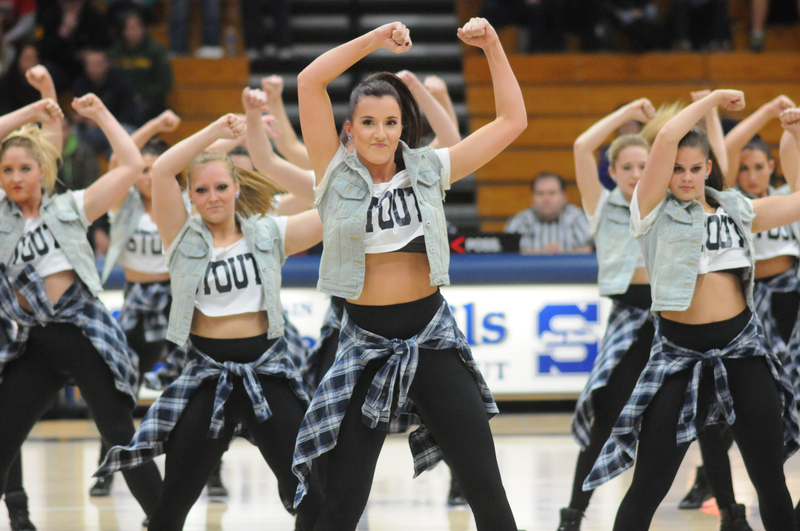 The Stout dance team qualified with both of their jazz and hip-hop routines. The team missed finals for Division II open jazz by a slim .25 points, but on the upside the team received sixth place in Division II hip-hop. The team quickly realized that their strength was their energy and personality. “One thing you can always depend on with this team is a great performance! We definitely have fun when we dance, and it showed on the National’s floor last week,” stated Werner, who has been a captain for two years. The dance team was not accustomed to performing in competitions that had such an emphasis on vocal presence. In local competitions earlier in the year, judges had frowned upon counting and yelling saying that it was a distraction. At NDA Nationals, vocal presence was a part of the teams’ overall score. The Stout team was not accustomed to vocal cues and they were forced to incorporate it into their morning practices before the competition. According to Werner, the team’s greatest strength is their versatility. “We have studio-trained girls who have intensive training in ballet technique, and then we have former competitive gymnasts. We have different backgrounds in dance but it all comes together for an incredible scale of skill level. One of my favorite parts about this team is that we teach each other,” said Werner. The National Dance Association National Invitation was an overall great experience for the team. “Daytona was covered with collegiate cheerleaders and dancers practicing in any open space they could find. It was a mini dance community for the week, and that was really cool to be a part of,” said Werner.